Israeli forces demolish buildings in Abu Nuwar, July 4, 2018. Photo credit: WAFA. At least 62 Palestinian Bedouins of the Abu Nuwar community in Jerusalem are now homeless. 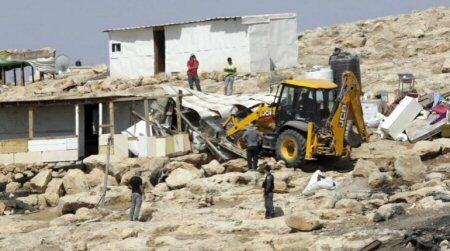 Israeli forces demolished nine homes and three agricultural buildings in the Palestinian Bedouin community of Abu Nuwar at 9:00AM on July 4, 2018. Abu Nuwar lies on the eastern outskirts of Jerusalem in the central West Bank. Photo credit: UN Office for the Coordination of Humanitarian Affairs. Ma’an News reported that Israeli forces raided the village, evicted locals from their homes, removed some of their belongings, and then demolished the structures. Israeli human rights group B’Tselem estimates that the demolitions left 62 people newly homeless. According to the UN Office for the Coordination of Humanitarian Affairs (OCHA), at least 670 Palestinians live in Abu Nuwar, 88 percent of whom are refugees. Abu Nuwar is located in Area C of the West Bank on the outskirts of Jerusalem, meaning it is under full Israeli military and civil control. Between 2010 and 2014, OCHA found that Israeli authorities approved just 1.5 percent of Palestinian building applications in Area C. Moreover, Abu Nuwar is one of the dozens of Palestinian Bedouin communities in the central West Bank at heightened risk of forcible transfer due to Israeli plans that aim to settle eastern Jerusalem (the E1 corridor) and thereby connect Ma’ale Adumim settlement to Jerusalem. Israeli demolitions in Jerusalem appear to be on the rise since the month of Ramadan ended – a time when Israeli authorities will temporarily halt most demolitions. At the end of June, Israeli forces demolished nine Palestinian-owned buildings in Jerusalem just four days.